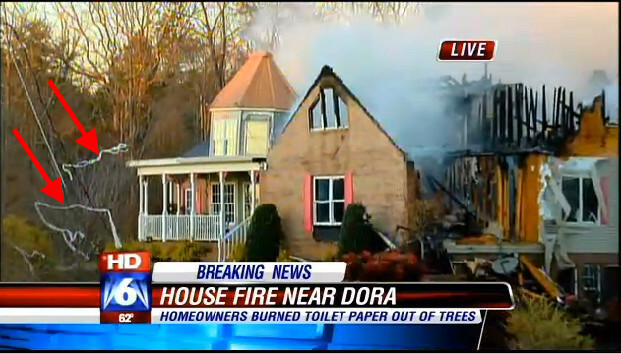 A family's attempt to clean up their TP'd house (or "rolled house" as some say) in Dora, Ala., went horribly awry when they lit the toilet paper on fire in order to get rid of it. Cheryl Crausewell told WBRC that neighborhood kids left her house and yard strewn with toilet paper Saturday. When she and her son were cleaning up on Monday at around 2 p.m., they found pesky bits of paper stuck in the branches of a tree, and tried to get it out by lighting it on fire. A gust of wind blew the flaming toilet paper into the yard, igniting the grass and then the house itself. No one was injured in the blaze, but the home was destroyed. To add insult to injury, a photo of the wrecked home shows that some toilet paper remained in a tree. Not only is fire not a great way to clean up toilet paper, it's also not the best for ridding your home of snakes. In May, a Texas woman burned down her house and damaged her neighbor's residence when she tried "to kill a snake with fire."